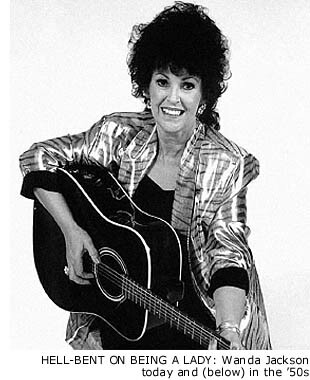 A Celebration Of Wanda Jackson"
Wanda Jackson was a phenomenon in the conservative fifties, she really was a long way ahead of her time and not only when it came to music. She had self-confidence and brought emancipation for lady-singers who followed her footsteps. Wanda went out on dates with Elvis for a while, he got reprimanded about shaking his hips on stage and she could swing in her little dresses with fringes! 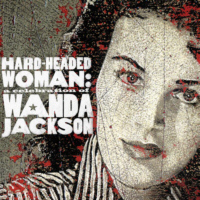 After years in which she seemed forgotten, Wanda received the acknowledgement she deserves with the album "Hard-Headed Woman" (that one's not featured! ), filled by musicians who admire her. 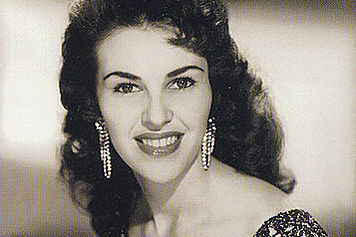 Twenty-one tracks, Wanda's originals but also the covers she successfully recorded, in the various styles she felt comfortable with, although the emphasis is of course on rockabilly and country. From the obvious performances to pieces that were pulled real close to the artist, like Trailer Bride's "Fujiama Mama". Fun to see who plays with whom, Neko Case for example has Joey Burns (bass), Dallas Good (guitar) and Jon Rauhouse (pedal steel) behind her. There's even a song on there by the Dutch Ranch Girls! The highlights? Ultimate revenge of the jilted bride: "Box It Came In" by Anna Fermin's Trigger Gospel, the crystal-clear voice of Laura Cantrell, Jesse Dayton's "Both Sides Of The Line", that tasteful duet by Sheri Hurst with Brian Henneman of The Bottle Rockets, Jane Baxter Miller with mandolin accentuations in Kristofferson's "One Day At A Time" and that gorgeous voice of Jesse Sykes in "Weary Blues", originally a Hank Williams song. Plus Wanda on the CD-cover, painted by Jon Langford! Written by Johanna J. Bodde, Dutch original of this review previous published on Real Roots Cafe, The Netherlands.